One way to achieve this goal is to implement and to certify management systems in respect for compliance to such international standards as EN ISO 9001:2008, EN ISO 14001:2004, OHSAS 18001:2007, EN ISO 13485:2012, EN ISO 22000:2005. International certificate today is in demand in any business. International quality systems certification currently is an organized standards classification reflecting various requirements for manufacturers and providers, who are obliged to focus on the final customer’s interests. This standards matrix is symbolized by an abbreviation ISO (International Organization for Standardization). ISO certification has an efficient analog – system of standards GOST R ISO that is an effective tool in market relations adjustment in terms of positive competition. Expansion of market segment for goods and services sale including the entrance into the global market. You should also take into consideration the fact that compliance of the management system with the international standard EN ISO is an integral attribute of CE certificate receipt. 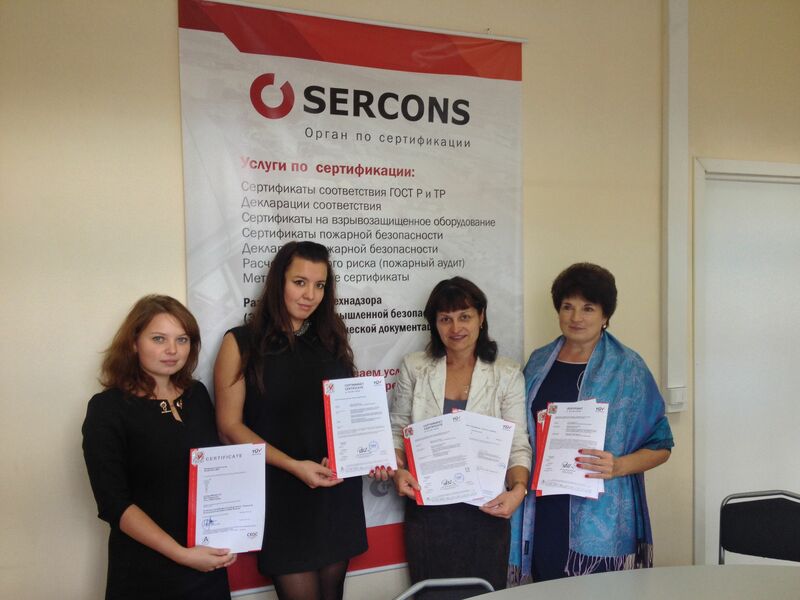 Sercons, LLC is a local representative of the leading international company TUV Austria Group. Our Company offers certification of your Company’s management systems in respect for compliance with the standards of EN ISO range. TUV Austria Group is Company aimed at technical safety precautions, cares for natural resources and improves the quality of its services and products. TUV Austria is an established certification authority in Europe. Wide range of rendered services along with huge possibilities allows the Company corresponding to the most discerning customer’s requirements and individuates the Company among its concurrents. Our experts are high-class professionals with the status of TUV Austria’s top auditors. Passed training in Autonomous Non-Profit Educational Organization “Register of Staff Certification System” in specialty “Management Systems Certification according to ISO 14000 and OHSAS 18000 standards”, completed the further training courses of State Educational Institution of Additional Professional Education “Academy of Standardization, Metrology and Certification” in specialty “Quality Management Systems Certification”. Passed training in Autonomous Non-Profit Educational Organization “Register of Staff Certification System” in specialty “Management Systems Certification according to ISO 14000 and OHSAS 18000 standards”.